These are the new Common Core State Standards for kindergarten mathematics. This cute and teacher-friendly printable would be great to keep in your lesson plan book or grade book for easy reference. These are the new Common Core State Standards for 1st grade mathematics. This cute and teacher-friendly printable would be great to keep in your lesson plan book or grade book for easy reference. 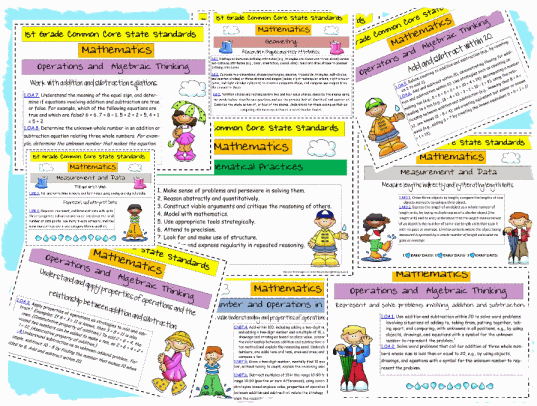 These are the new Common Core State Standards for 2nd grade mathematics. This cute and teacher-friendly printable would be great to keep in your lesson plan book or grade book for easy reference. 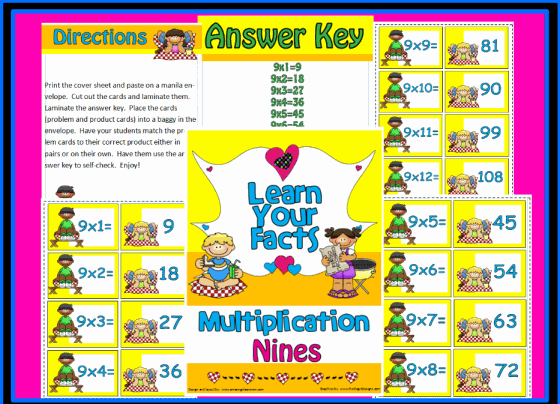 Your students will be sure to learn their multiplication facts - nines with this math center. Laminate the cover page and attach to a manilla envelope. 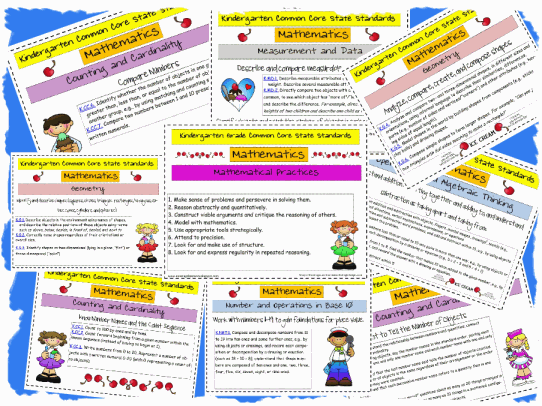 Cut out and laminate the cards and have the students work on their own or in pairs to match the problem cards with their product cards. An answer key is included so students can self-check their work. Enjoy! 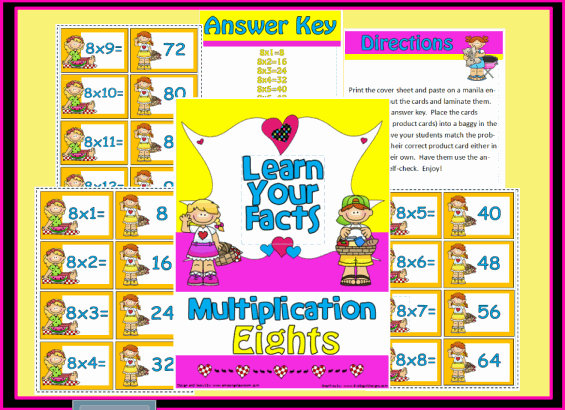 Your students will be sure to learn their multiplication facts - eights with this math center. Laminate the cover page and attach to a manilla envelope. 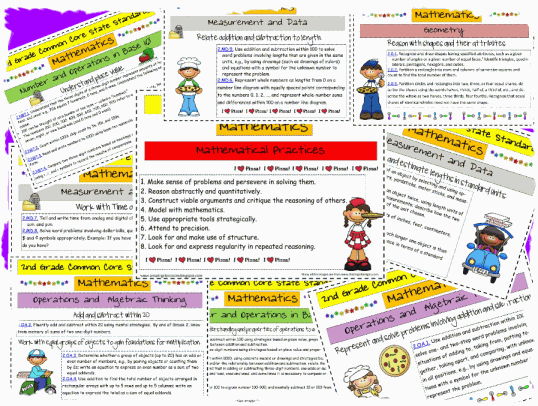 Cut out and laminate the cards and have the students work on their own or in pairs to match the problem cards with their product cards. An answer key is included so students can self-check their work. Enjoy! 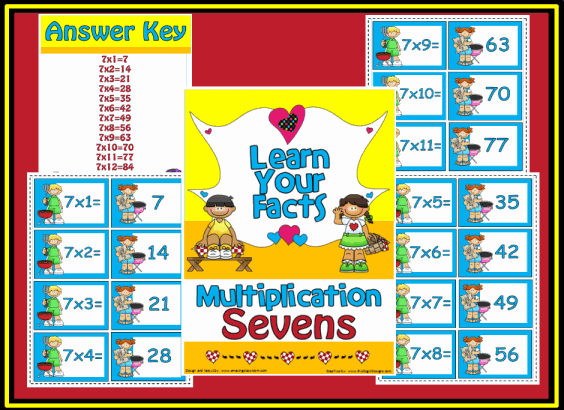 Your students will be sure to learn their multiplication facts - sevens with this math center. Laminate the cover page and attach to a manilla envelope. Cut out and laminate the cards and have the students work on their own or in pairs to match the problem cards with their product cards. An answer key is included so students can self-check their work. Enjoy! 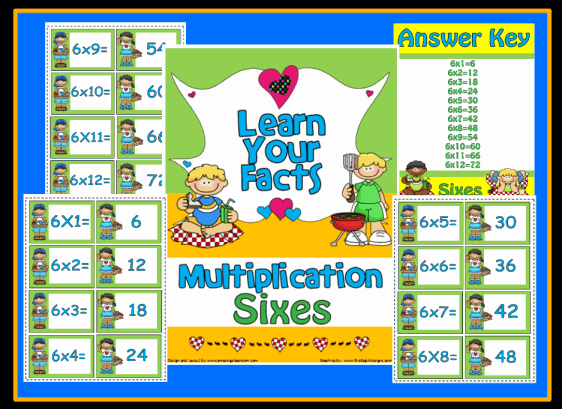 Your students will be sure to learn their multiplication facts - sixes with this math center. Laminate the cover page and attach to a manilla envelope. Cut out and laminate the cards and have the students work on their own or in pairs to match the problem cards with their product cards. An answer key is included so students can self-check their work. Enjoy! With this fact or opinion activity page, you will be sure to know which of your students have mastered the concept of fact and opinion. 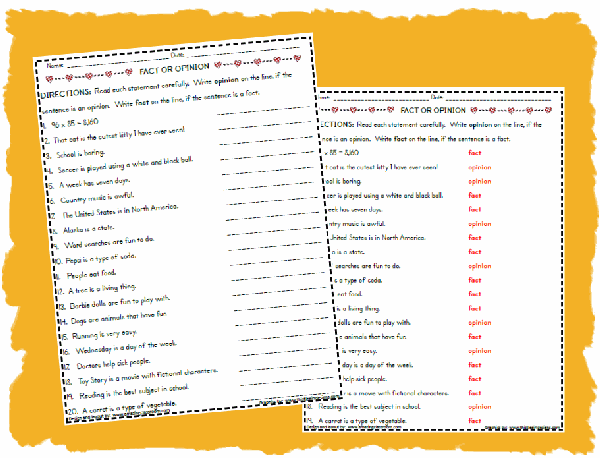 This worksheet includes twenty statements and student have to identify each statement as either fact or opinion. An answer key is included for easy grading. Enjoy! 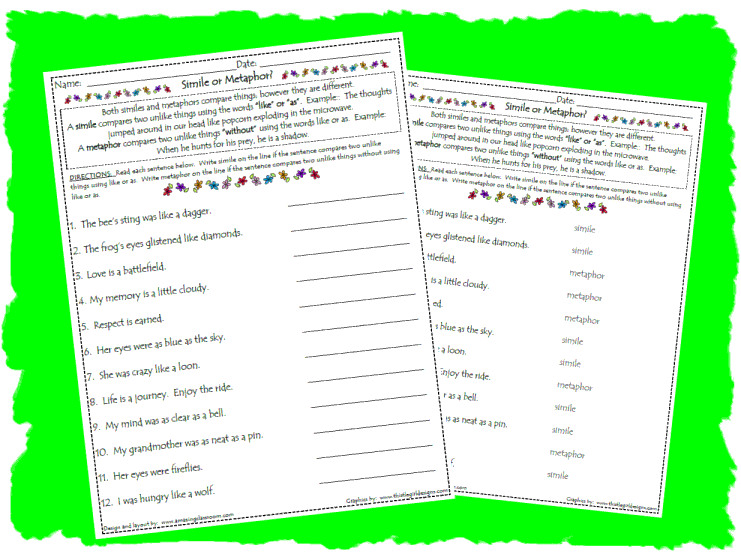 Give your students this simile or metaphor worksheet to see what they know. Do they know the difference between the two? Use as a formative assessment, or as a summative assessment after you have taught figurative language. This activity page includes an answer key for easier grading. Enjoy! This game will add fun to your reading stations or center activities. This game includes a title page for the manilla envelope, setup directions, game play directions, a game board, three sets of cards for a total of 45 different questions and answer keys. Thistlegirl graphics add fun to this game. 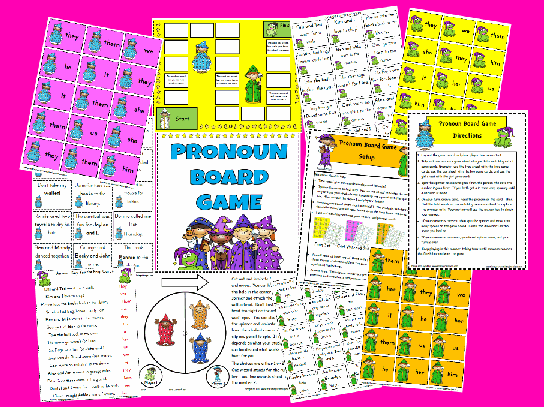 Your students will get great practice with pronouns while having fun. Use this in addition to our Pronouns flipchart and activity page. Enjoy!